Clarification: When handling or applying pesticides, do so in accordance with all the label instructions and state and local regulations. 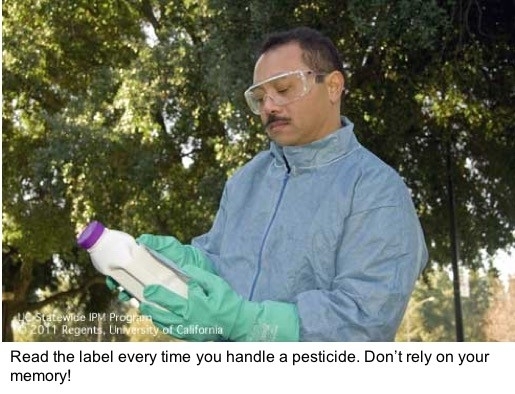 In California, regulations often require additional precautions that may not be stated on the pesticide label, such as the use of chemical-resistant gloves, protective eyewear that shields the brow and temple area, and other equipment. 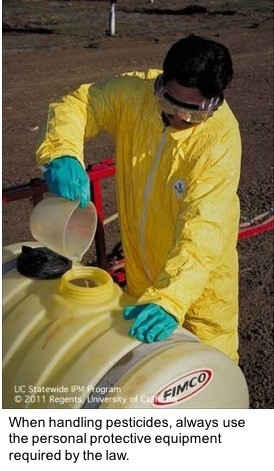 This equipment is required to be worn during pesticide handling with few exceptions (consult the Code of California Regulations, section 6738, for more information). 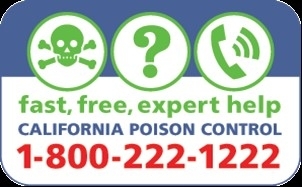 The tips described in this blog post are not an exhaustive list of safety measures that prevent pesticide poisoning. If you apply pesticides anywhere outside of the home and garden, or if you work in areas where pesticides are applied, you must also comply with the annual training and certification requirements listed in CCR 6724 and 6764 (links below). Pesticide handler and fieldworker training helps prevent pesticide hazards and poisoning. This blog post cannot be used as a substitute for required training.